My daughter Meg requested “a clock with glowy numbers” (i.e. a digital clock) because her room at Nana’s house has one, and because it’s cool. About that time, my vintage childhood alarm clock stopped going off at the right time reliably, which is super annoying if you want go somewhere. So I bought a cute, round, bright red, working alarm clock and Meg inherited my old one. It does indeed have glowing numbers, and – get this – it has a radio. 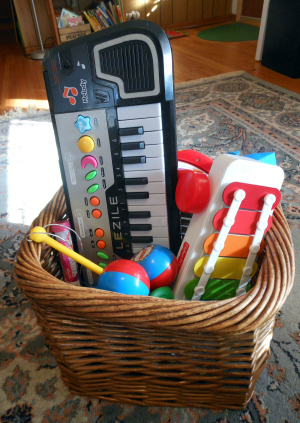 When you push buttons, music comes out! It’s just like Mom’s ipod! All was happiness and harmony, except for the station the radio was set to. It was one of those contemporary hits stations, which my five-year-old is not prepared to listen to unsupervised. Also, I detest “Shake It Off.” But I didn’t want to take away her beloved radio, so I decided on a sneak offensive. I waited until she was busy in another room and crept over to the radio. I turned the dial. You know that moment while you’re searching for a station, and all you can find is static, “Shake It Off,” and more static? It’s a terrifying moment. But was that the classical station? CLASSICAL MUSIC! YES! Meg never knew the difference. Sneakiness for the win. Classical music is one area that I feel like our homeschool is succeeding. We’ve always included it in our listening, right along with Veggie Tales, big band, country, show tunes, and oldies. (We are nothing if not eclectic.) So Meg doesn’t regard it as “classical music,” but just as music. I like to shop at Fresh Market because they play classical music, which feels so civilized to me. And they have coffee samples. Meg likes to shop at Fresh Market because it has a huge candy aisle right down the middle. If a good song comes on, we are not above dancing and have been known to bounce right down the row behind the cart. This has the added advantage of amusing Kate, who also likes to bounce to music. 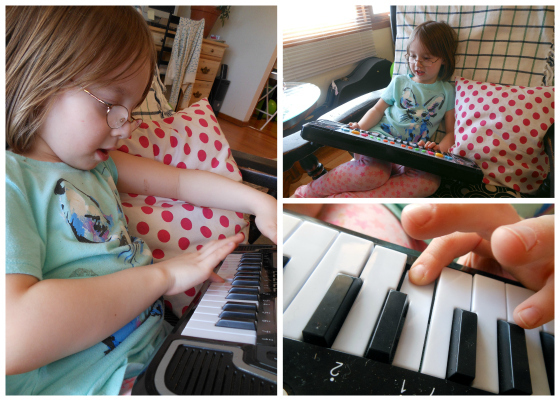 We got a bunch of toy instruments for Christmas, including a teeny-tiny keyboard, so when life gets dull I give Meg a lesson on finding C and playing a C scale. 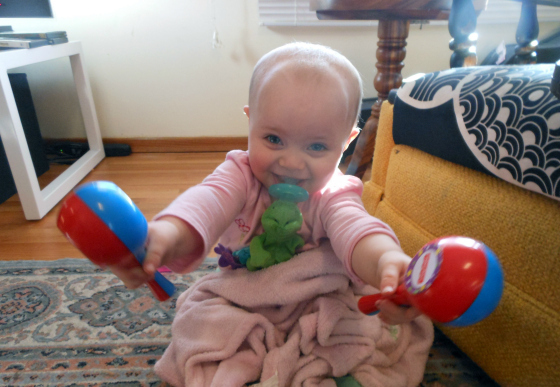 I think she’ll enjoy guitar, when she is a little older and has tougher fingers. Meanwhile, we mostly listen and sing. And make up our own words to everything. It’s like Olivia in the books by Ian Falconer, who is illustrated as singing “40 Very Loud Songs.” We are very loud, which is why I think we shouldn’t move into anyone’s basement apartment any time soon. But I try not to feel badly about rewriting words for the Hallelujah Chorus – because seriously, we are interacting with the music up close and personal. How better to learn it? At home, Meg loves the Little Einsteins movies. Each episode takes a piece of classical music and gives it a story, a piece of visual art, and usually an international location. (Egypt! New Zealand! San Francisco!) Most episodes, they also give the music words to make it more memorable. They’re very decent shows as far as plot and character go; I much prefer them to, say, Land Before Time. I’m really frugal: I got one DVD as a gift and another at a consignment sale, and for the rest we check them out of the library. 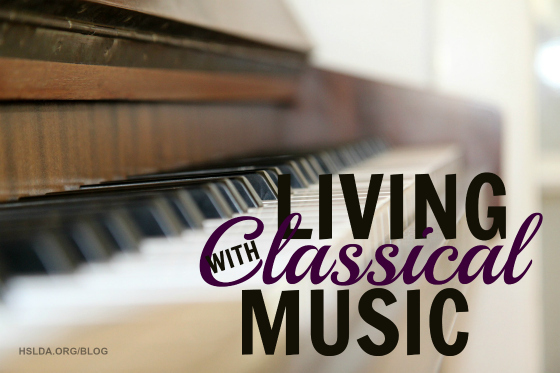 We get most of our straight-up classical music from the radio or free internet radio, like Spotify. Also from the library, we really enjoyed the book-on-CD version of The Composer is Dead, by Lemony Snicket, which is a murder mystery and actually kind of morbid, so you might preview it before inflicting it on your own offspring, but the instrumentation and music humor are delicious. Little Einsteins lyrics can be insidious, though. We were sitting at a stoplight, waiting to turn into Target, when the station announced the next piece would be by Mozart. Being a good homeschool mom, I seized the moment. And then the station started playing THAT VERY SONG. I felt absolutely brilliant. I can’t remember what the real title is, but I can sing the Purple Plane version. Photo Credit: First photo from pixbay, graphic design by Charity Klicka; all other photos taken by Carolyn Bales, edited by Charity Klicka.